Publisher's Note: Products purchased from Third Party sellers are not guaranteed by the publisher for quality, authenticity, or access to any online entitlements included with the product. 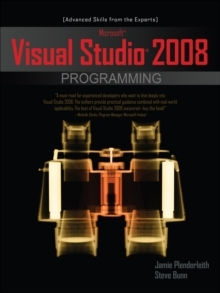 Take your Microsoft Visual Studio 2008 programming skills to the top tier"A must-read for experienced developers who want to dive deeply into Visual Studio 2008. The authors provide practical guidance combined with real-world applicability. The best of Visual Studio 2008 uncovered-buy this book!" --Michelle Clarke, Program Manager, Microsoft IrelandMaximize every powerful programming feature available in Visual Studio 2008 with expert instruction from two Microsoft MVPs. Through clear explanations and real-world code samples, Microsoft Visual Studio 2008 Programming reveals how to develop innovative, high-performance applications with C# and VB.NET. Learn how to deploy ADO.NET and WCF services, incorporate XML and Ajax scripts, build hack-resistant code, and much more.